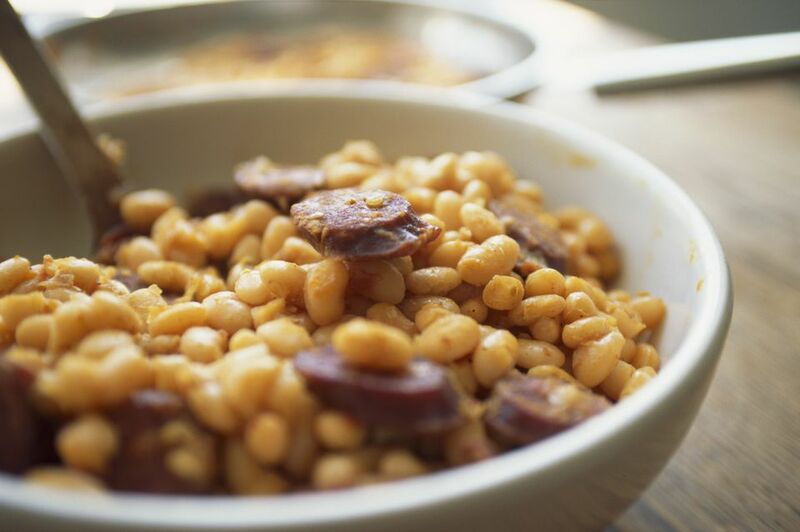 This beans and sausage casserole is a simple layered dish made with kielbasa or hot dogs, canned baked beans, onions, and apple juice. Feel free to add some chopped bell pepper to the dish. This is a good dish for a barbecue or potluck supper. It would be an excellent camping recipe as well. Simmer the beans and sausage in a covered Dutch oven over the campfire. Cut the kielbasa into 3-inch pieces then halve pieces lengthwise. Spread a little mustard over each cut side of kielbasa. In a greased 2-quart casserole layer 1/3 of the beans, sliced onion, and kielbasa. Repeat layers two more times. Season with pepper and then pour apple juice or cider over the casserole. Top with the buttered bread crumbs. Cover and bake at 375 F for 35 minutes. Uncover and bake for 10 minutes longer, until casserole is hot and bubbly.